A rich resource for all designers and artists looking for inspiration and guidance on colour combinations. A huge range of combinations is provided, with full readings for both CMYK (for designers working in print) and RGB (for Web-based and other multi-media designers). As an accomplished colour theorist, the author looks at colour combinations through various elements of colour theory, from hues, values and chroma to working with concepts such as simultaneous contrast and perceptual transparency. The author has also generated an inspirational series of colour palettes taken from photographs of the world around us, depicting landscapes, urban subjects and everyday objects. 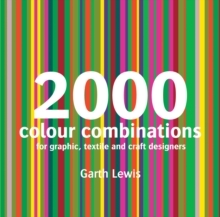 The book also contains a selection of work from cutting-edge designers and artists who explain the use of colour in their work and offer exciting new palettes. The colour combinations are rendered as two- and three-colour graphics, stripe studies and more unstructured and complex compositions, all of which showcase the huge variety of effects that can be achieved with colour. This fascinating book reveals the true magic of colour and is an essential reference book for any designer and artist.